When I look at the 10 shades in the collection, I think of the perfect spring-summer shades that one could own all at once. The lighter shades have a gorgeous creamy shiny finish and are so delicate looking that I absolutely fell in love with their charm while the darker brighter ones are so vibrant, creamy and shiny that once you wear them on your nails they will instantly brighten your outfit and your mood. I absolutely love this nail polish collection! Oriflame The ONE Long Wear Nail Polishes are packaged in a pretty looking tall glass bottle with a twistable cap attached to which is the brush which paints your nails. The nail polish bottles are slightly heavy and spacey to carry them around with you. The nail brush is very different from any nail polish brush I have come across. The brush is slightly similar to that of the Bourjois Nail Enamel brushes which I absolutely love. The bristles of the brush are flat and when viewed from the side looks just like a string. This brush design is fantastic as it applies the nail polish very evenly and swiftly. Regular nail polishes have a brush which is rounded which makes it a bit difficult to evenly coat the polish onto the nails causing a few streaks here and there due to acculumation of the polish but this brush works amazingly to leave a very even coat of nail polish. It fans out really well on the whole nail and thus doesn’t leave a streaky appearace at all. The wide flat brush makes application a super-quick and easy process. 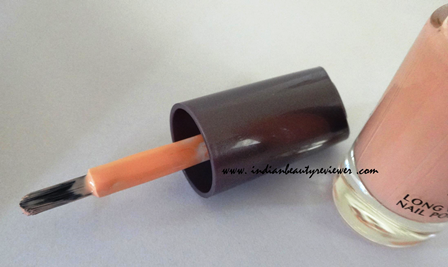 The nail polish gets coated in just one go onto the whole nail in a jiffy. 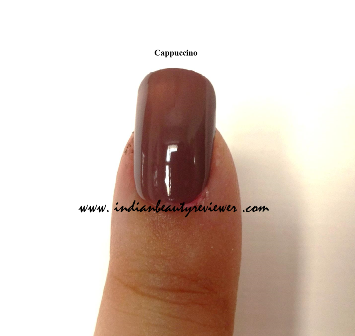 2 to 3 swipes of these nail enamels lends an intense color and extremely smooth appearance to the nails.A very smooth and creamy texture and slightly thicker consistency. This texture of the polish helps in giving the nails a super healthy and shiny look.Some of the darker shades like the bright reds and pinks have great pigmentation but few lighter pastel ones have a very sheer quality about them which makes them perfect French manicure shades. 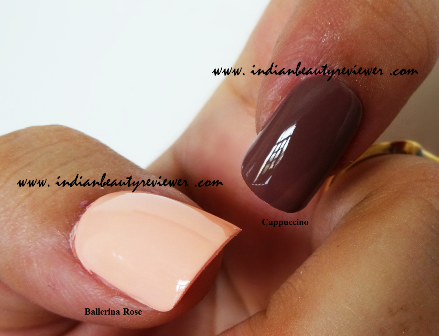 However 2 to 3 coats make the lighter colors appear brighter and slightly more pigmented on the nails.The nail polishes are not very quick drying. They take 5 to 10 minutes to dry completely on the nails. This can vary due to outside temperature as well. Oriflame The ONE Long Wear Nail Polishes have a creamy, shiny, smooth & completely streak-free finish. They gives the nails a very healthy look almost like gel nail polish does.The lasting power of these nail polishes is nothing extraordinary. The polish has a tendency to rub off pretty quickly from the tips especially if only a single coat was applied and a lot of water work is done with the hands. A touch up would be required pretty quickly depending on how much house work is being done. 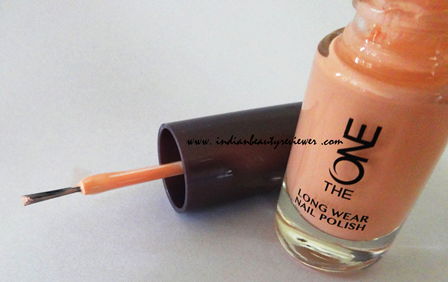 This is one of my most favorite shades from the whole of Oriflame`s The ONE Long Wear Nail Polishes Collection. In fact it is one of my favorite shades this spring-summer season. I love it because it is a really gorgeous looking very light peachy pastel color which looks very chic and is extremely pleasing to the eyes. 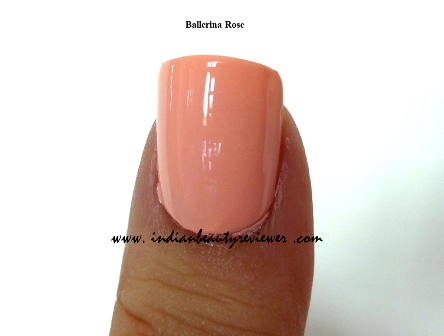 It is not your typical pinky-rosy color so don’t be fooled by its name. The name Ballerina Rose is very apt for it as it beautifully hints at the delicacy of this shade. 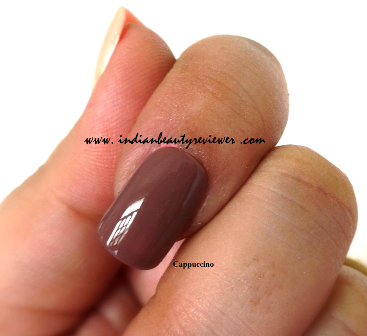 This nail polish is extremely pigmented contrary to its lighter colored counterparts from the collection. There is nothing sheer about it from the first go. The first coat is pretty intense and the second coat is extremely opaque. Although the first application leaves enough color on the nails but it does look a bit streaky. The second coat is the icing on the cake :) Like all other nail polishes from Oriflame`s The ONE Long Wear Nail Polishes Collection this too has a super shiny and creamy looking finish. I love this color so much that I`ve have bought two back-ups of it already !!! Need I say more ?!!! One of the most gorgeous browns I have come across in a long long time. This is a beautiful muted dirty brown shade almost drifting towards a taupey brown color. I could say it has a color similar to a dirty milky latte, if that makes any sense! Great color to sport in offices and at formal meetings and conferences. The finish is very shiny and creamy like all other nail polishes from this collection. 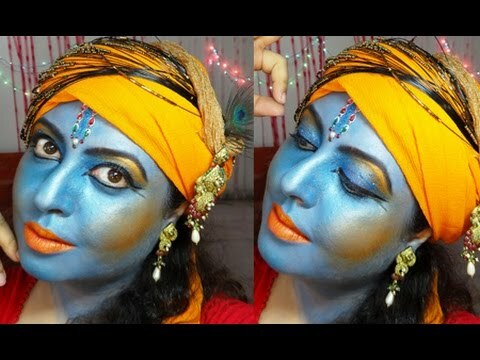 Oriflame offers very good quality of nail paints. 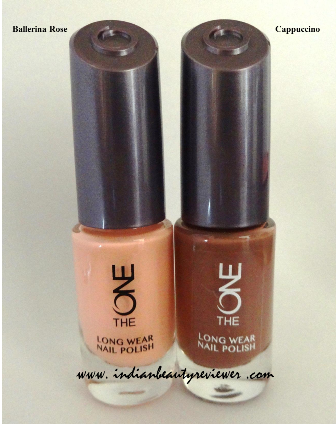 I've just bought its The One Long Wear Nail polish in red and purple shades and I loved them totally. This is available in few other shades too and I'm planning to grab them too....shades are pretty cool, trendy and just perfect for the season.